Recently, here at Conjuring Arts, we have been working on transcribing a large file of letters from Ed Marlo to Mel Brown. They span from 1954 to 1991 and are quite fascinating, containing gossip, reviews of books and videos, tricks and sleights, tips and finesses, etc. While the work on these is not finished, we thought we would whet the appetite by offering a small gallery of photos of Ed Marlo that we have in the archives. We believe that these were taken during his trip to Paris for Pierre Mayer’s convention. 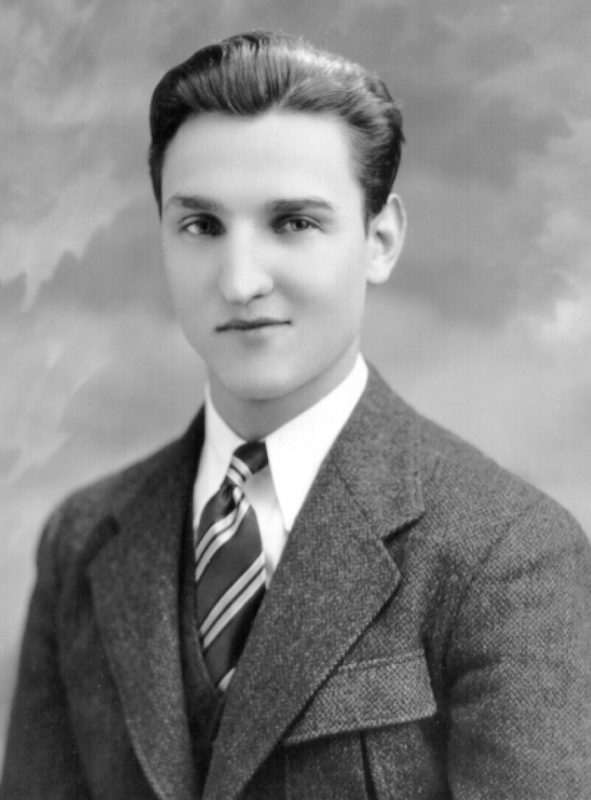 There is also video footage of Marlo that was taken during the trip which is available through Stevens Magic Emporium (Ed Marlo – A Private Lesson number 1 and number 2), if you want to see him in action during this period of his life. One of Marlo’s first publishing efforts was to enter into Tops magazine’s “It’s a Pip” contest. He entered three ideas into the contest, which is not surprising considering the vast creativity he would demonstrate for the rest of his career. Note that he was still using his given name Edward Malkowski with a nickname, “Marko”, which his friends had given him. 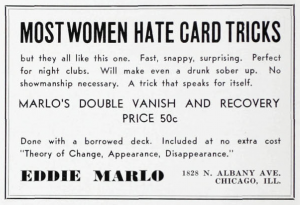 The following ads represent Marlo’s first attempts to market his material to magician’s. 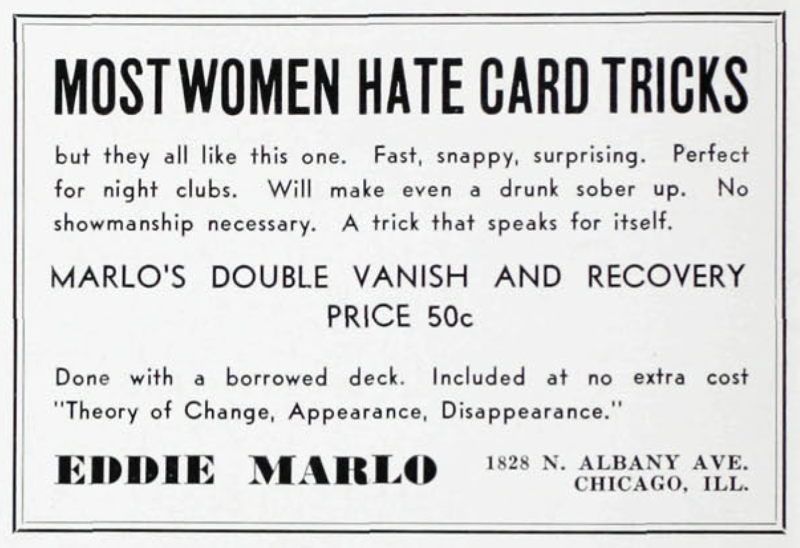 Both of them feature Marlo’s “Double Vanish and Recovery” which is an effect wherein two cards vanish from the deck, then one reappears face up in the middle, and then the face up card is used to locate the other card. Additionally the effect included “Theory of Change, Disappearance and Reappearance” which was an essay featuring the idea that any standard color change could be used to create the effect of a change, a vanish, or a production. 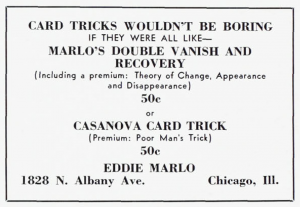 The “Casanova Card Trick” utilized the mechanics behind the vanish in “Double Vanish and Recovery” to produce the four Queens. Finally we see “Poor Man’s Trick” in which the performer made a penny travel through his head into a glass and then the penny was placed in the right sleeve only to travel out the left sleeve and into the glass. 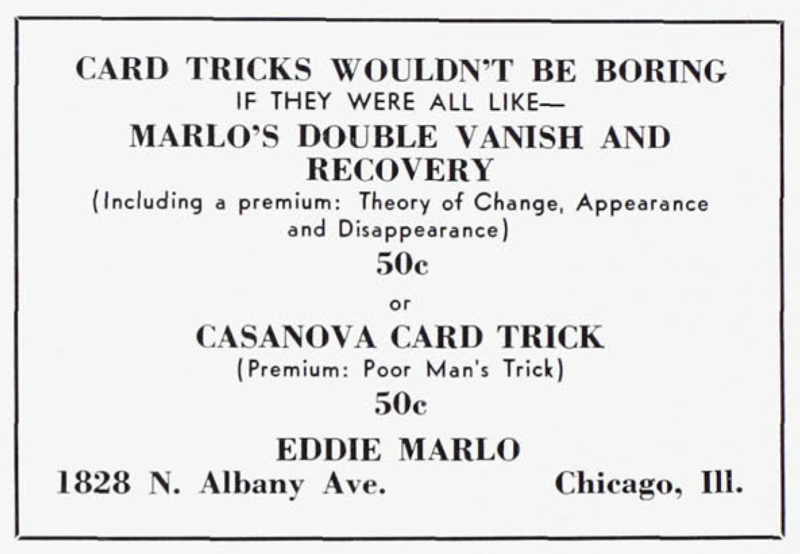 “Double Vanish and Recovery” and “Casanova Card Trick” are available in Marlo’s book Deck Deception, and the “Poor Man’s Trick” is explained in Bull’s-Eye Coin Tricks. I did not find “Theory of Change, Disappearance and Reappearance” reprinted anywhere, but Sid Lorraine had a copy of it in his files which are available at Conjuring Arts. Finally, here are some biographical pieces about Marlo. “Eddie Marlo as I Know Him” by Frances Ireland; The Linking Ring Vol. 25, No. 11 January 1946. 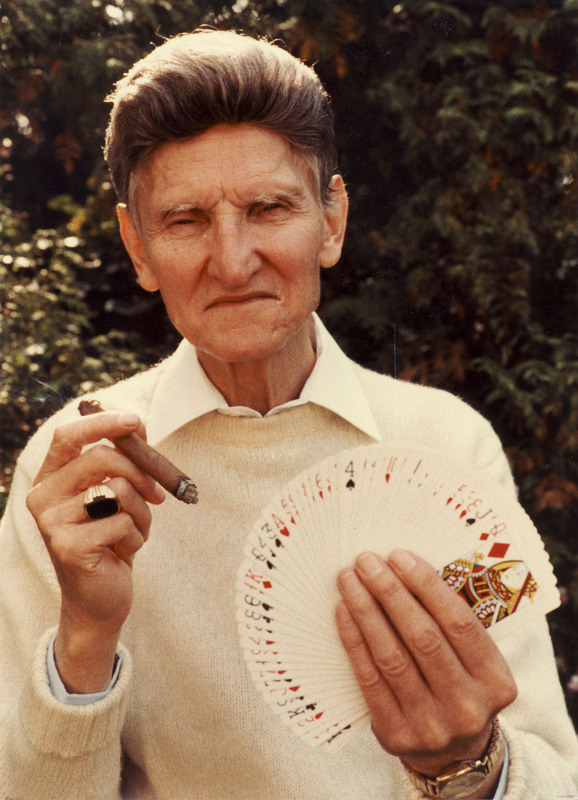 “Cardician Marlo” by Frances Ireland; The Linking Ring Vol. 37, No. 4 June 1957. “The Amazing Mr. Marlo” by Bill Simon; MUM October 1978. “Some Notes on Edward Marlo” by Jon Racherbaumer; MUM October 1978. MAGIC Magazine Obituary; MAGIC Magazine Vol. 1, No. 4 1991. Linking Ring Obituary; The Linking Ring Vol. 72, No. 01 January 1992. MUM Obituary; MUM Vol. 81, No. 09 February 1992.